Silk Flowers – Plan before you buy! Two white orchids plus leaves and a handful of thin wooden sticks. The grey pebbles are from the beach. Hong Kong. My daughters had asked me a while ago for flower arrangements to add some color to their rooms. Clearly, those flowers had to be of the low maintenance sort. In other words, real flowers weren’t an option. Thus, I headed to Hong Kong’s flower market today to look for red and orange silk flowers. (Actually, I am not sure whether the flowers are really made from silk. But as they look good I guess it does not matter what fabric is used and I will keep using the term “silk flower” throughout this post). A friend of mine accompanied me. She was on her way back to New Zealand and planned to pick up a few flowers for her home as well. The selection, price and beauty of silk flowers available in Hong Kong is truly amazing. Thus, if you happen to be in town, it pays to take a look! At the entrance of the flower market is a huge, multi-storied shop: “Brighten”. This is where I usually go. They have a great selection, fair prices – it adds up though! – and (big relief!) air-conditioned premises. Two tall amaryllis, a selection of large green leaves and super tall sticks from Ikea. To add further interest, I complemented the whole thing with silver spirals. The pebbles hold everything in place at the bottom and ground the bouquet. For what room do you need the flower arrangement? In other words, where would you put it? Flower arrangements are like pieces of art or furniture in the sense that they have a presence and require space to work. Squeezed carelessly into a corner, the most beautiful flowers won’t add anything to your decoration. Size? Should the arrangement be rather short, medium sized, or tall? 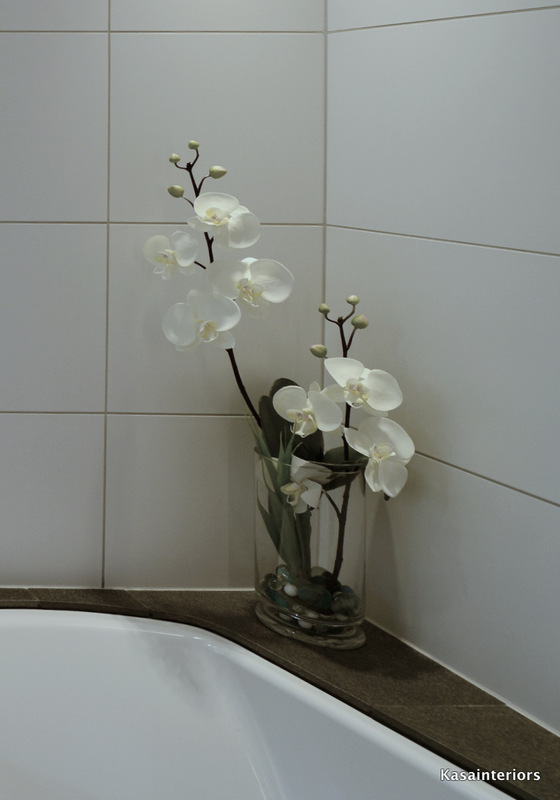 Do you prefer flowers in a particular color to match the color scheme of your room? Depending on style, type of flower, and size of bouquet, you may need to buy extra leaves. Some silk flowers (e.g. roses and poppies) come with the leaves attached and look good in a bouquet without adding any further green stuff. But others (in particular, orchids) do not. Orchid leaves are sold separately. Just ask the staff where they are. Two white orchids, with the stems bent to achieve different heights. One set of orchid leaves plus pebbles. Done. Which vase will you use? Do you plan to purchase one after you got the flowers? Or do you already have a vase at home? Color, size, and style of the vase largely determine what you will be able to do and whether you need accessories such as pebbles, colorful marbles, little metal trinkets, etc to bring the arrangement to life. If you plan to use a glass vase, I suggest you add some accessories to cover the vase’s bottom. I don’t recommend to leave a glass vase empty as that would look somewhat incomplete. 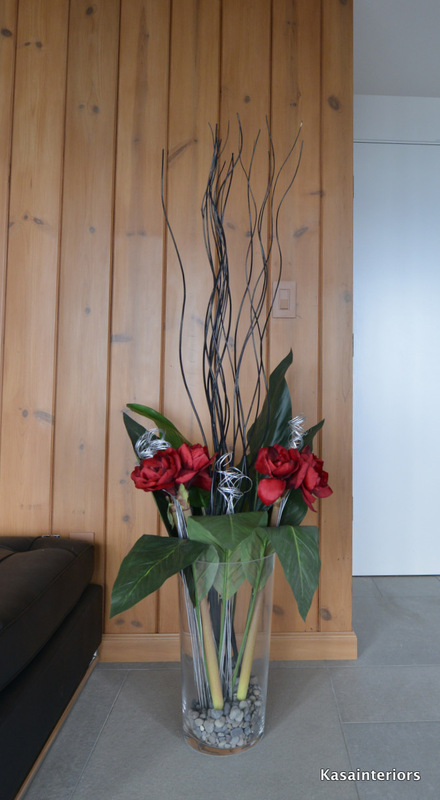 Unusual accessories add interest to the arrangement and signal that you don’t intend to “trick” anybody into thinking that these flowers are the real thing. In sum, before heading to the flower market, it pays to make a little plan. It will help you not to feel overwhelmed by hundreds of choices once you are there and prevent you from buying flowers you won’t need.